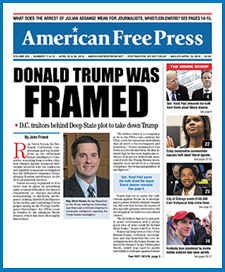 Get a PDF copy of the latest issue of AMERICAN FREE PRESS for free by clicking here. Even better, get access to AFP Online all year long for only $15 with an archive that goes back to AFP’s issues published in 2006, by clicking here. No credit cards. PayPal only! Yours is the greatest newspaper in the world! Only you tell the truth without fear or favour. Great newspaper. Keep up the great work.